WHO ARE THE MILE HIGH MYSTICS? The Mile High Mystics is an organized collective of Spiritual Mystics, Metaphysicians, Psychics, and Alternative Healers doing shows and providing services in Prescott, Arizona for over two decades. The group was started in 1994 with the first show held at the Full Moon Café House. Response to the show was initially so great, there was a line of people running out the door and down the block! Seeing the need for more events the group began shows at the Smoki Pueblo Museum, Hotel St. Michaels, Hampton Inn, Springhill Suites and the Hassayampa Inn. Shows in Chino Valley are held at the Days Inn. The Mile High Mystics’ shows have been renamed Festivals. We generally offer four shows each year, in February, May, July and October. Clients and visitors to the Festival can rest-assured they will receive a high quality reading or healing. New members must demonstrate their abilities to two current members or their work must be known and experienced by other club members before they are allowed to participate in club events. 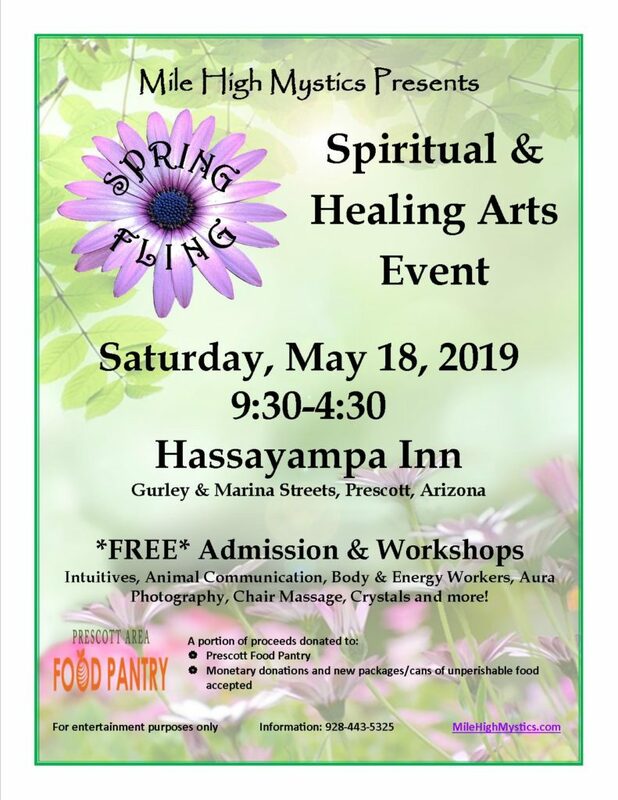 Mile High Mystics’ events run from 9:30 am to 4:30 pm, and are located at the Hassayampa Inn, 122 E Gurley Street, Prescott, AZ.